A simple no-bake dessert made with just 4 ingredients! 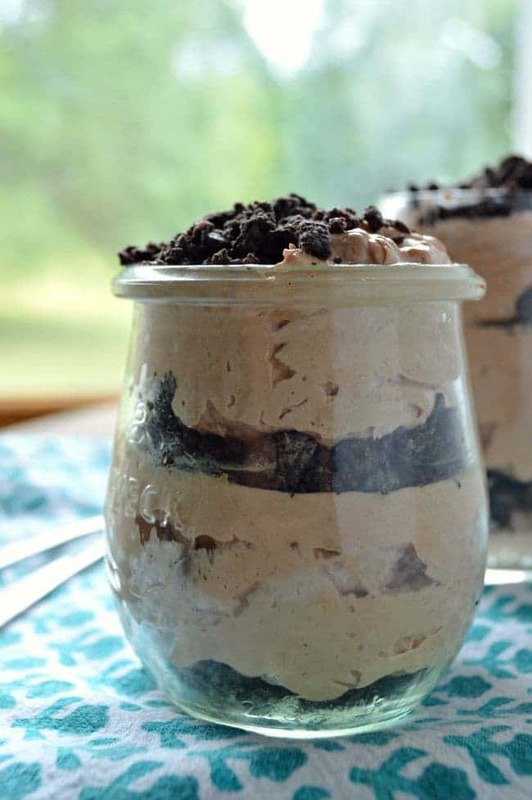 Nutella Oreo Cheesecake Parfaits come together in just 10 minutes for an easy tasty treat. 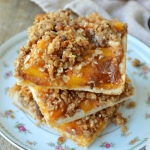 This recipe is originally from 2013 but the post and photos have been updated. 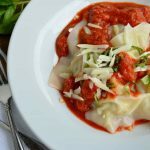 Some of my favorite recipes are those oldie goodies and I just had to re-share! You CANNOT go wrong with a ten-minute, four-ingredient, no-bake treat. It has been 1 bajillion degrees here for weeks and I can’t even deal with the weather. CAN’T DEAL. We are hiding indoors with the shades drawn all day because even checking the mail makes me feel like I’m melting. I *think* we should reconsider installing a pool. Anyway. I’d like to say that heading out of doors in the evening is something that happens, but then you are at risk of being carried off by mosquitoes. The freaking mosquitoes!!! Does anyone know what happens when you spray for mosquitoes? Does it hurt the birds? What about the butterflies? I’m pretty hippie dippy about that kind of thing. I make all the boys in the house do the catch and release thing when I find a spider, and last month when the exterminators came to do their quarterly little spray thing I made them avoid an entire outside area by the garage because there are praying mantis’ in my garden. But it would be pretty fab if I could walk out onto the deck without worrying about West Nile. So these are no-bake, cold, Nutella-filled, delicious. They also come together in like 5 minutes. You COULD technically eat them right away but I prefer to refrigerate them for a couple of hours before digging in. They also freeze well. Put the lid on tight, throw them in the cooler, and take them to the pool! Pass them out at a baseball game!! Have a picnic! Put them on the table at your next cookout. You could also technically pour that mousse filling into a pie crust and then freeze to slice. 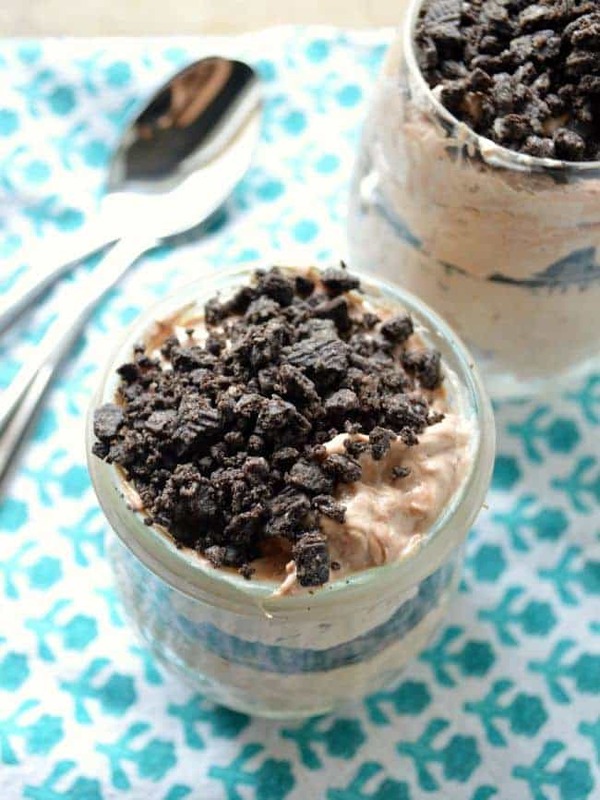 Nutella Oreo Cheesecake Parfaits are pretty easy to lighten up if that’s a thing you’re interested in. You can use 1/3 fat cream cheese and lite whipped topping. Also! Oreo Thins. They worked well here and you can eat more of them for the same amount of calories. 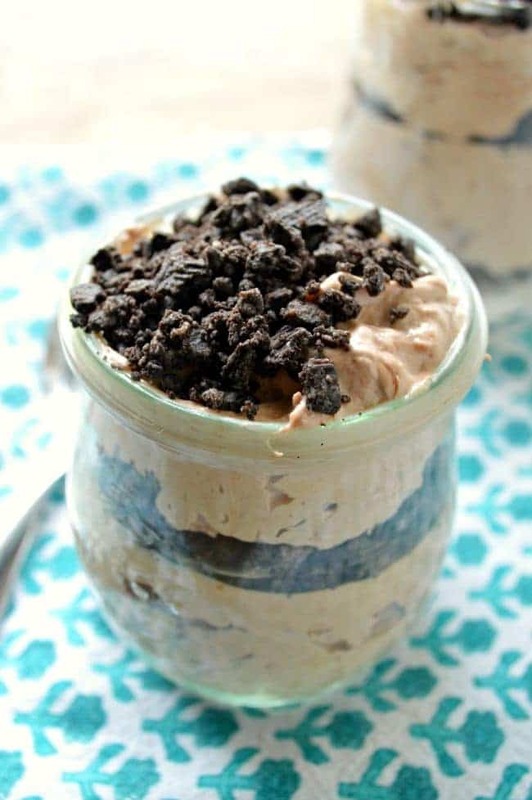 Nutella, cream cheese, and Cool Whip are blended to make a creamy delicious mousse that is layered with crushed Oreo cookies. So simple! Grind the cookies in a food processor until fine crumbs have formed. In a large bowl beat the Nutella and cream cheese until it's blended and fluffy. Fold in the Cool Whip so the mixture stays light and airy. I mixed mine on low. Spoon the cookie crumbs into the bottom of each jar. Add the Nutella mousse mixture over the crumbs. Tap the jars on the counter to let the mousse settle so it will make pretty layers. Add another couple of spoonfuls of cookies and then more mousse. Tap the jars on the counter again, garnish with a few sprinkles of the cookie crumbs. 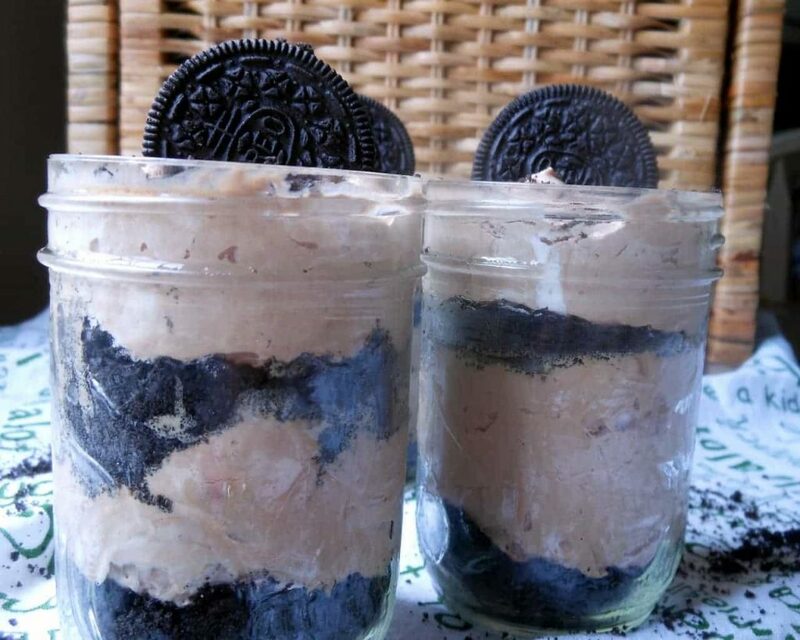 Leave the cookie garnish off the top, screw the jar lid on tight, and these would be PERFECT for a picnic! 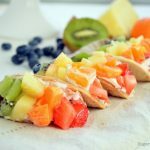 Toss them in the cooler to take to the pool or a ball game. Fun!! Really think this would be fun for 4th of July, add a cherry! We loved your recipe so much!!!! It was totally easy and delicious. Thanks so much!!! OMG simple, yet so beautiful and decadent! You can’t go wrong with nutella and oreos, for reals! Love your little pint jars too. Great pick! Thanks Anyonita!!! I’ll do that! Nutella definitely improves all things. This is a decadent dessert —–Yeah. Looks scrumptious. I enjoyed cooking from your blog and proud I stayed away from all your fantastic dessert recipes. Such will power. We enjoyed the stir fry very much and I can see it being made often. Hey!! So glad you liked the stir fry!! Hope you’ll try some dessert soon! Just had lunch… Was full but now my stomach is growling and my mouth is watering after seeing these babies… Oreo and nutella in one dessert… heaven! 5 minute dessert. Make it!!! 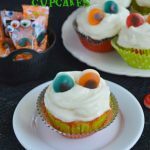 oh these look so amazing Heather! My stomach’s growling after seeing this. Its 2 am here and we ate dinner at 8. Nutella and cream cheese are fantastic- I tried it with nigella’s no-bake cheesecake. Can I use whipped cream instead of coolwhip? and hope whatver is happening sorts itself out soon! YES!!!! Use whipped cream!!! It was cheaper for me to buy the Cool Whip than it was to buy heavy cream– usually I have it on hand but I guess I got carried away with buttercream. Anyway– whipped cream will be totally rich and delicious. Thanks so much Rachel! Hope you enjoy! They look incredible! In my cookbook, I have a dip/spread recipe in it that uses Nutella, Oreos, and PB. This is pretty much the same, but with Cool Whip and cream cheese. I love making dips with coolwhip/cream cheese, too. They are sooo good! This recipe of yours is perfect! All the flavors I love. Thanks, Averie!!! Nutella, Oreos AND Peanut Butter? I’m in. I am going to do SO many naughty things to this icebox pie. Namely, shove my face in it and never come back up for air. 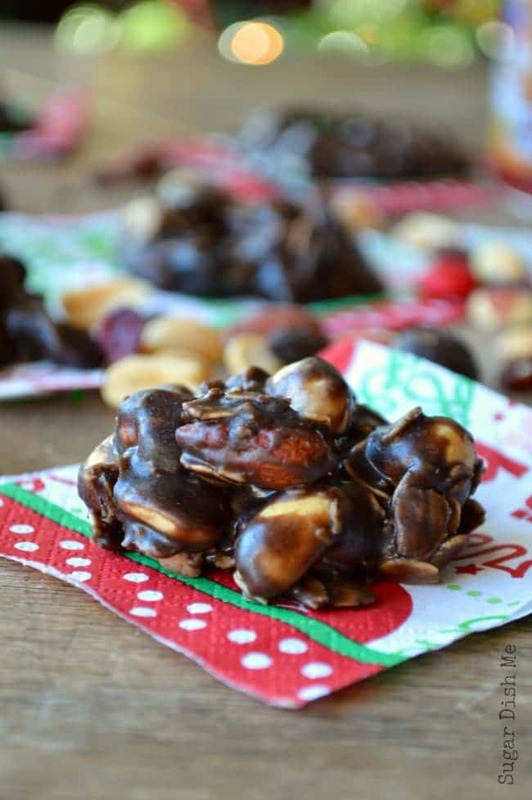 No bake anything is good…no bake nutella goodness? YES PLEASE!! YUMMY!! You can never go wrong with Nuetella or whipped cream or Oreo cookies! Great recipe, Heather! Thanks, sandra! I totally agree. Plus this is like the easiest dessert in the universe. I like the sound of Pink Lemonade Icebox Bars– going to check those out now! Thanks, Erin! Orea + Nutella, I just think it’s perfect combination. Looks so tasty. I have to try it, I will definitely like it.